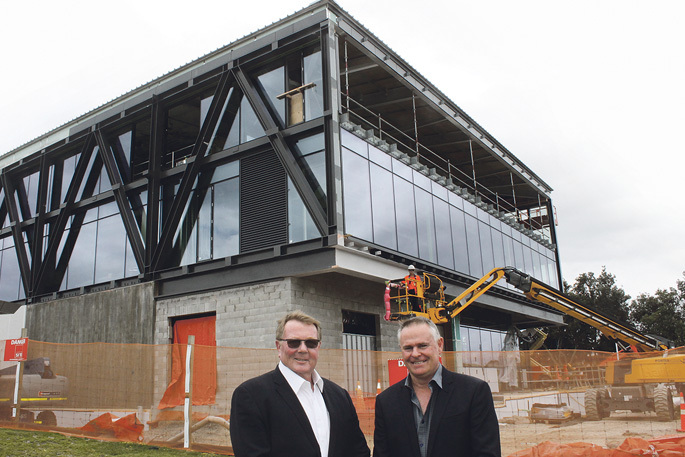 Incoming Zespri chairman Bruce Cameron and current chair Peter McBride, in front of the new Zespri building under construction at Mount Maunganui. Zespri growers have achieved what few others have been able to do – co-operatised a corporate, says retiring chairman Peter McBride. In March this year more than 75 per cent of Zespri shareholders voted to change its constitution to strengthen grower ownership and control. Under the targeted share offer, which closed on October 19, Zespri accepted 427 applications to purchase more than 12 million shares for a total of more than $95 million. More than half of the applications were from previously unshared growers and the percentage of total shares in Zespri held by growers has increased to 85 per cent. Incoming Zespri chairman Bruce Cameron is also pleased with the outcomes of the constitutional changes and the targeted share offer and share buy-back. “This provides for a strong and solid industry. The real winners are the new Zespri shareholders and the individuals now able to exit shareholding with a fair value for their shares,” says Bruce, who has been Zespri deputy chairman since 2013 and a director since 2010. Peter and Bruce say while the kiwifruit industry’s successes in recent years have significantly increased orchard values, young people shouldn’t be deterred from orchard ownership. In 2011, after the vine disease Psa-V struck, gold orchards were worth around $400,000 per hectare. “They are now worth north of a million dollars and green orchards have gone from approximately $250,000 to $450,000 per hectare,” says Peter. “Ownership for young people is not easy but it can be done. They need to work hard and save money. They need to be brave and take opportunities when they arise. Bruce agrees, saying the financial performance of the industry means kiwifruit orchards offer opportunities as viable intergenerational businesses, something many other primary industries do not. Since 2013 the industry has experienced growth in average-per-hectare returns across all kiwifruit varieties of 55 per cent, and growth in the share price from 50 cents in March 2013 to more than $8 a share. Bruce says the focus now is on managing and maximising the returns from Hayward and SunGold cultivars, as Zespri grows its share in the global fruit market. “We also need to continue to innovate and explore new opportunities like bringing to market a new green or red to complement our gold. “By being the world leader in kiwifruit and using our strong commitment to innovation, our industry should always be evolving to ensure we are ahead of the competition,” says Bruce. It is also critical that Zespri is aligned with the growing international organics trend. “Organics is becoming more and more important in a world where consumers are focused on food safety. “So, ensuring that Zespri has an organic category that can meet future demand is important,” says Bruce, who becomes chairman in February next year when Peter steps down after six years as chairman and 17 years as a director. He retires as a director at Zespri’s next Annual Meeting in July 2019. Bruce says to keep pace with global demand for organics, the Zespri board and management recognised it had to make a step-change in how it could attract investment to their organic category. “Greenfield developments are crucial to ensuring Zespri has in future a full offer to its wholesale and retailers in our markets,” says Bruce. Peter, who has been elected as a director on the Fonterra board, says it was time for him to leave Zespri.